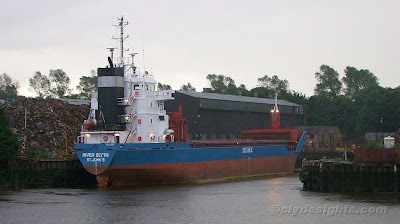 Seen in the former Lobnitz shipyard basin, which has now been dredged following the recent visits from the dredger CHERRY SAND, the coaster RIVER BLYTH had newly arrived from Londonderry to load a cargo of scrap. RIVER BLYTH is managed by Stephenson Clark Shipping, a British company well known in the past for their fleets of colliers and which claims to be the oldest British shipping company. She is 4,935 tonnes deadweight, and has an overall length of 89.75 metres. She was built in 2000 by Scheepswerf Pattje at Hoogezand, and is owned by a German company.